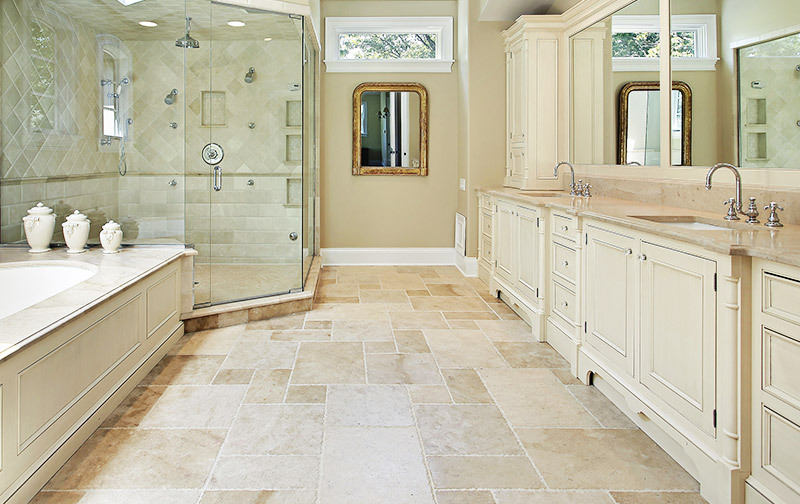 Wouldn’t it be nice to have warm bathroom floors on a cold winter morning? Imagine how comfortable it would be to hop out of your steamy shower onto a warm floor, and into a warm bathroom in general. If this sounds good, consider installing a radiant heating system with your flooring during your next bathroom makeover. Flooring paired with a radiant heat system is a cost-effective, energy-efficient way to warm your home. It can be electric, hydronics (hot water), or air-heated—all using tubes installed beneath your floors. With a radiant heat system, your room and flooring are warmed through the surface of the floor instead of through air above it from a traditional heater or furnace. And, although other floor types may get the job done, tile is the best flooring for radiant heat, especially in bathrooms. When you’re selecting tile to use with your bathroom’s new radiant heat system, there are two important questions to keep in mind. Water is unavoidable in bathrooms, so waterproof flooring is a must. That’s why, given its moisture-resistance and durability, tile is a popular choice for many homeowners. It comes in ceramic, glass, porcelain, and metal. In particular, ceramic and marble tiles are great heat conductors—exactly the quality that you want for your radiant-heated floors. Among all the options, tiles made of ceramic and marble will be the most conducive. A radiant heat system warms more than just your floor. It will warm your whole bathroom from the ground up. In fact, less energy is required to heat a room using radiant heat than a traditional furnace. Tile is a less expensive flooring option than hardwood and marble. Designing your bathroom with tile floors and a radiant heat system may continue to save you money on your regular furnace heating, for years to come, depending on the type of radiant heat you install. The maintenance routine for cleaning for tile bathroom floors—wiping away water, sweeping up loose hair, and quickly mopping—are the same for those with a radiant heat system installed. Your flooring will clean-up and look and feel just like a standard tile floor, but with added benefit of providing warmth and comfort. You can find any kind of tile you want at Kermans Flooring. We carry an endless array of options for your radiant-heat bathroom floor. There’s something durable and eye-catching for every budget. Thinking about remodeling your bathroom? Unsure where to start? We can help. To talk with a professional for free about installing a radiant heat system with your flooring, schedule a design consultation.